• PLOT SUMMARY: What brings a team together? Justice! Batman and Martian Manhunter have been slaughtered. But they are not the only heroes to fall at the hands of villains. The murder has to stop, and it's time to take the fight to the bad guys! 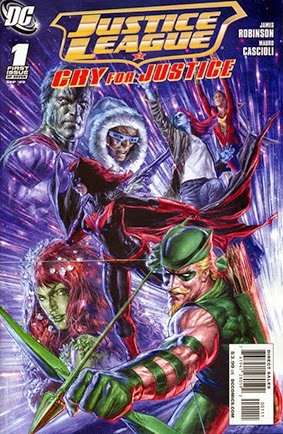 Green Lantern, Green Arrow, Supergirl, Atom, Shazam, Congorilla and Starman unite in a cry for justice! This 6-part miniseries from James Robinson (STARMAN, SUPERMAN) and rising star artist Mauro Cascioli (TRIALS OF SHAZAM) pushes our heroes to the brink and beyond as evil can no longer be tolerated to win. But when Prometheus plans his revenge on not only the heroes, but on the very places they call home, will this new team be ready to pay the cost for the justice they seek? This time it's personal - and it'll only get more bloody before it's over! Includes "The Origin of Congorilla" a 2-page tale by Len Wein, Ardian Syaf & John Dell. Written by James Robinson. Cover and art by Mauro Cascioli.